Image by Sara Matos, courtesy of Lincoln Center. As Tcheka played unaccompanied solo guitar in a black box theater at Lincoln Center Fri, July 28, my notebook filled up with inadequate comparisons and question marks. “Paulinho Da Viola?” “Aurelio?” “Nick Drake? ?” Fact is, Tcheka is from a generation of Cape Verdean musicians known as the “Pantera generation,” who, like their namesake Orlando Pantera, are noted genre smashers. 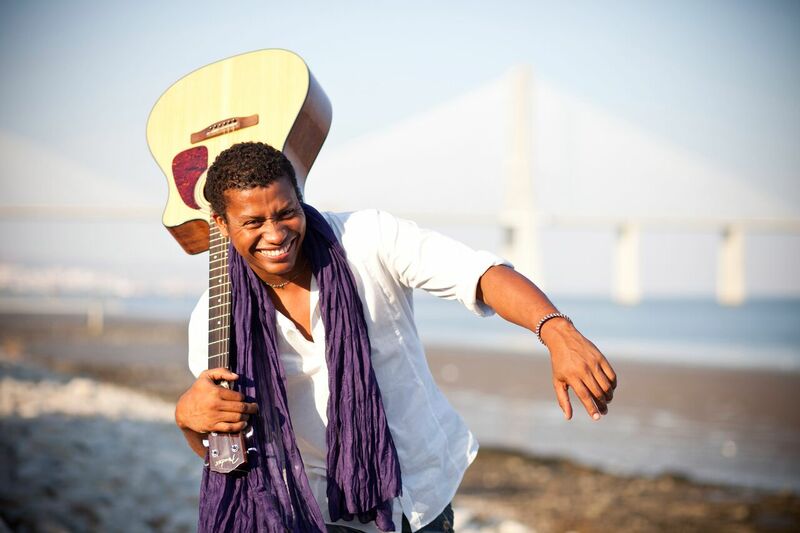 With just an acoustic guitar and his voice, Tcheka can slide from something like a Brazilian samba to something like Aurelio Martinez's Garifuna folk, to even a misty British singer/songwriter's hushed fingerpicking. Perhaps it's fitting that Tcheka should come from an island 350 miles off the coast of the African continent, as his music is undeniably African, but with a step towards the New World. Tcheka could be called a revivalist but not a traditionalist of batuque, one of Cape Verde's oldest genres. Its three-beat rhythm over a two-beat rhythm, depending on how it's played, can sound like a Brazilian samba with extra swing, which is fitting as samba is one of batuque's musical children. Like samba, batuque is traditionally communal, involving a lot of percussion and call and response, but the Pantera generation has adapted it for solo performance, and merged it with other Cape Verdean genres and global influences, much like how João Gilberto adapted samba and jazz into small-ensemble bossa nova. In the case of contemporary composers like Tcheka, of course, it's possible that highlighting the Brazilian influence is an aesthetic choice; he even name-checked bossa nova early on in his set and occasionally, he finds that low-key groove. Typically, though, Tcheka's songs are more firmly in a minor key than most of the bossa nova songbook and played with more intensity. His voice has a pleasing rasp to it and he nimbly rides up into his upper register, verging on falsetto, with ease. Making his American debut, Tcheka came out and greeted us in Portuguese and admitted with a smile that he didn't feel all that confident in his English. Without stage banter, he charmed the crowd, which sat in awe throughout the hour he played. By the time he apologized for not knowing much English for the second time, a female voice called from the normally staid Lincoln Center audience, offering him lessons. His fifth album is scheduled for release this year.